By reviewing Net-Maps that my colleagues share with me I am picking up on all kinds of typical misunderstandings. 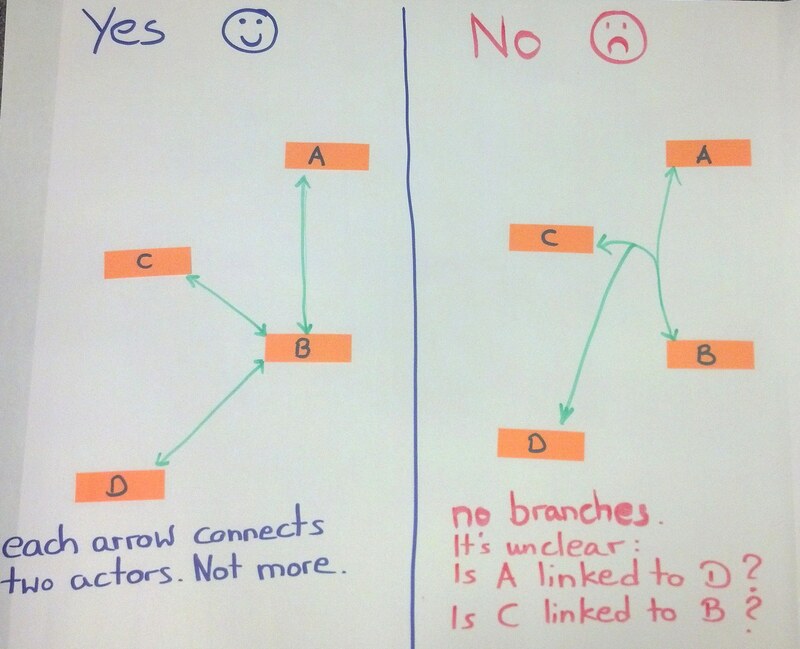 Many are easy to fix once you know what they are… Here I would like to share two that you better avoid in order to have clear and specific maps: branches and boxes. Some participants intend to make things easier and reduce the mess on the map by drawing links that have branches. However, while it looks like it makes things easier; it actually leads to confusion and less clarity as to who is linked to whom. Please insist that each arrow can only link two actor cards. This is another attempt to make the picture less messy and save time. Participants put actors in boxes and instead of linking individual actors, they link boxes, put influence towers on boxes, put plus and minus signs on boxes. In most cases this leads to a picture that is incorrect. Because what it means is: Every actor in box 1 is linked to every actor in box 2, which is rarely the case. 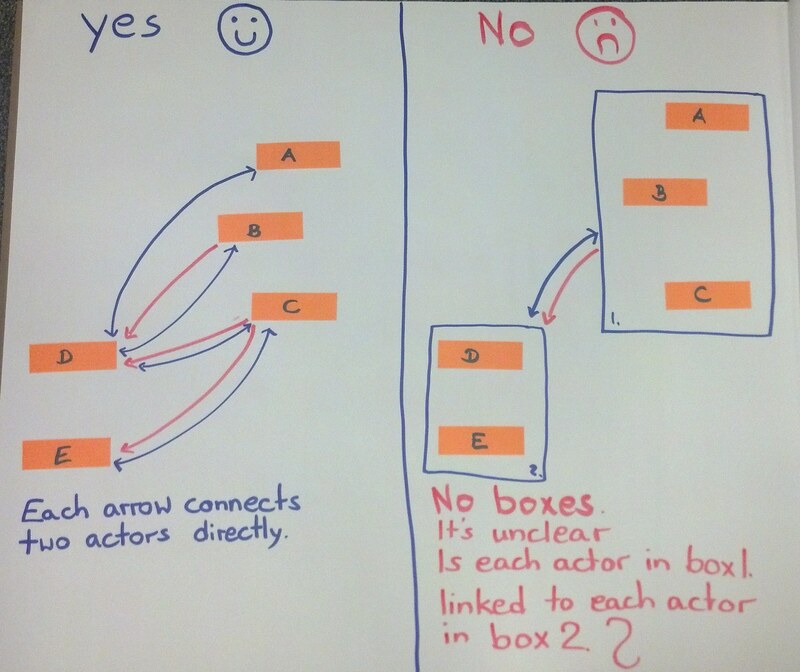 By putting the actors in boxes, participants paint a generic picture that will not help them develop concrete strategies in how to deal with specific actors. If they insist that there is a group of actors (e.g. NGOs) who, for the question at hand, act as one, with the same links, goals and influence, give them the option of grouping these actors by writing one actor card that reads “NGOs”. But, in general, only do that with marginal actors, not with central ones. Help participants to avoid drawing generic maps that will not solve their specific problems. To try solve problems and issues using net-mapping is a new idea for me, I need to take more practise, because it looks very effective option.